Join Us in Chino, CA May 17-18! by Robert Greinert . This tail is particularly historic to USAAF and 5th Air Force history. It is from the P-47 that Col. Neel Kearby, a 22 victory ace, and medal of honor recipient. He went MIA in this aircraft over Wewak. In 2001, the remarkably intact tail section, with original paint and US Army serial number visible were recovered by HARS in Australia, and now are to be donated to the USAF Museum in Dayton, Ohio. This is one of the most important donations in the history of the PWD website, and are honored present its story. 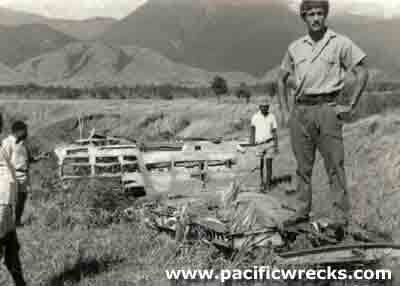 This story begins on Guadalcanal, with the discovery of a WWII dogtag. Via email, Jimmy Nuake contact Pacific Wreck Database for assistance in locating the former owner of the dog tag, and to learn more about its history. On the first phone call, the owner's daughter, Ann Modzel was found. Learn both sides of this story, from two sides of the world, and the generosity of those who found it, to return it to the grateful family. by Robert Greinert . Learn about the restoration work and team behind this restoration. This Beaufort wreck is the only restored Beaufort in Australia, and one of the few in the world. Its role in Commonwealth & Pacific WWII history is significant and honored by this restoration. by Daniel Leahy. The restoration of DAP Beaufort A9-557 has been completed and the aircraft was placed on public display for the first time in ANZAC Hall on March 8, 2003. On March 28, the Australian War Memorial, in conjunction with the RAAF Beaufort Squadrons Association, held a commemorative function to officially unveil the restored aircraft. Originally, only about 70 guests were expected to arrive, but in the end closer to 450 were in attendance. These included veterans, relatives, Air Force dignitaries and researchers. The Leahy's family name is synonymous with Papua New Guinea history and exploration. Richard Leahy lives in Lae, and over the past decades, has been involved in the discovery of dozens of WWII wreck sites, MIA sites and the work of U.S. Army CILHI to recover remains to return them to the United States. Australian Pennefather spent most of his life in Papua New Guinea as a 'Kiap', or Patrol Officer and businessman. During his travels, his interest in wartime history blossomed, and his travels to remote villages lead to the discovered of many wartime relics and wrecks, including several aircraft discoveries. He shares some of his recollections and work in New Guinea from the late 1960's until the late 1980's. Report by Daniel Leahy, lead moderator. The forum is coming along nicely. Recently there have been discussions concentrating on NEIAF and Japanese aircraft wrecks in Australia, aircraft carriers in the Second World War and more requests for information about relatives who served during the war. If you have not already done so, browse the forum, and join in order to post. Ghost Wings, America's fast growing and celebrated aviation magazine, has just released its best edition to date, the stunning Issue 9. Boasting groundbreaking stories of military aviators and aircraft from WWII to Vietnam, Issue 9 includes crisp original artwork and seldom-seen vintage photos, in full color layouts. by Koji Takaki & Henry Sakaida. Little is written about the Japanese air defense of the the home islands at the end of WWII. This story is told in with vivid pilot profiles, mission histories and stunning photographs. History and accounts from both the Japanese and American sides of the campaign allow the reader to understand the vicious aerial combat that occurred in the skys over Japan, from late 1944 until the end of the war. Barrett Tillman's book tells the story of SBD units during WWII, and tells the stories of its pilots and missions. At the time of its design, it was one of the world's most modern and advanced dive bomber designs, that filled the multiple roles of scout and dive bomber in the USN. His research covers Dauntless operations through the war, including unit strengths, losses, successes and even air-to-air victory totals. Author Tagaya tells the history of this famous bomber. At the start of the war, the bomber changed the course of history off the Malay peninsula in particular, Bettys were instrumental in the sinking the British battleships Repulse and Prince of Whales. Like the dive bombers and torpedo bombers at Pearl Harbor, the Betty's success sunk the reign of the battleship.